I told you I’m obsessed with this sweater. You saw me wearing it in last week’s post here (in pink) and now today! I am really so picky with turtlenecks but this one never seems to do any wrong. It’s so soft, oversized and the coziest thing you will ever wear. If you invest in anything this fall/winter, invest in this! It also comes in some other colors… including my pink one. I really love wearing black on black. There’s something so simple yet chic about a black on black ensemble and it’s what I resort to wearing when I have no idea what else to wear. Because we all have those days, right? I recently picked up these booties and am really happy I decided to invest. I didn’t have a pair of black booties but found myself really needing a pair for so many of my daily outfits! These are perfect and I love the gold touch and bow zipper detail. Anyways, these earrings are currently 30% off! I usually never wear different earrings. I have a few statement earrings I wear, but when it comes to studs, I only wear a pair my parents got me. But, I absolutely love these! I think they add a unique touch to your outfit without going overboard and they aren’t too heavy. They really are beautiful! I’m going to be wearing them a lot (so sorry in advance). They are on sale until end of day today so make sure to take advantage! Love the all black outfit. So simple but so chic. and the earrings are so pretty. I love the black on black look as well. I love your earrings!!! They really stand out against all the black. This outfit is so so elegant! This is a really awesome outfit. I love the bag! Very pretty! I love that you always list your lipstick because I’m always swooning over it. Have you done a make up tutorial at all? Ah! No I haven’t! I’m planning on it once I launch my YouTube channel this year!! 🙂 I’m a lipstick hoarder… it’s kind of bad! Such a perfect sweater! Love your hair up! 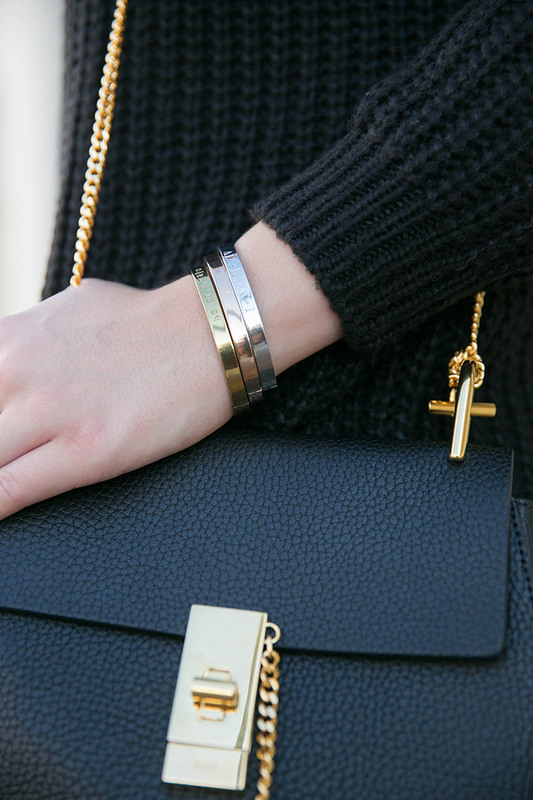 Monotone (black especially) is one of my favorite looks- it’s such an easy way to look so chic! Super gorgeous! I love the simplicity of this. 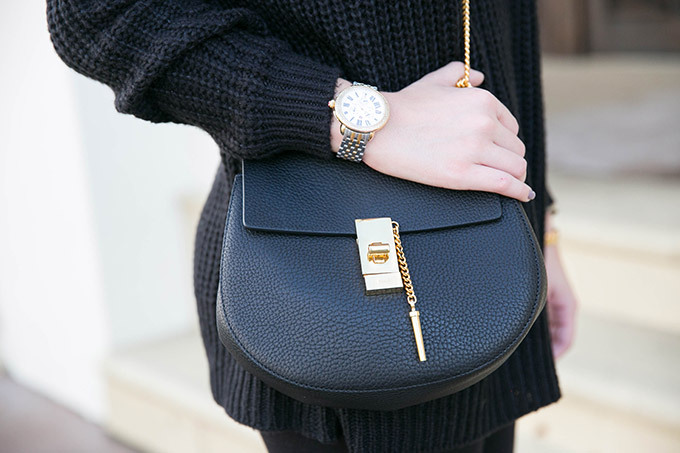 Loving black on black – and need that bag! You have just given me SO MUCH inspo! Loving the all black!! So pretty, Lauren! Love the black on you! I’ve been loving wearing a lot of black this season. Your outfit is so adorable and chic. Your hair looks so cute pulled back! Beautiful mix of textures and I looooooooooove that bag!!! It’s perfect! 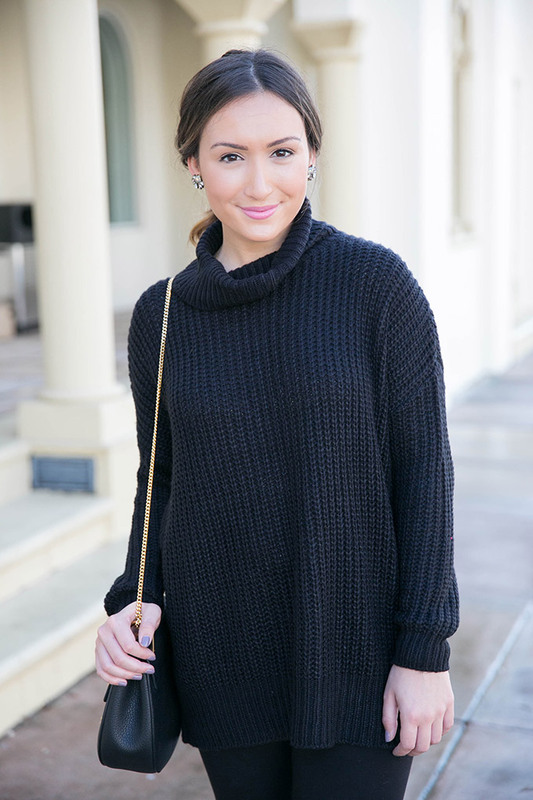 Black on black is always such a clean, classic look! That sweater looks so comfy!